Authorities said he accepted a bribe from a Honolulu company in exchange for $7.8 million in government contracts. (AP) — A Micronesia government official has pleaded guilty to a federal bribery charge in Hawaii. 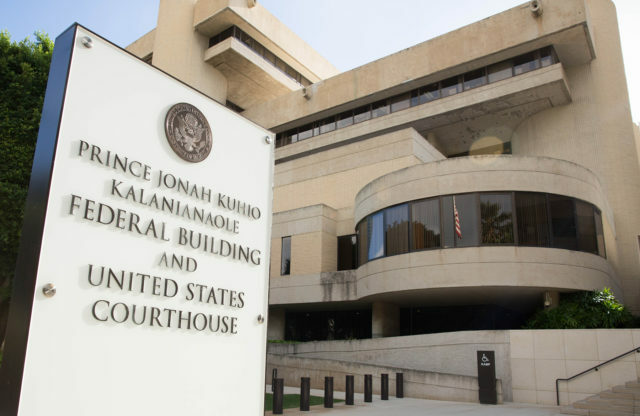 Master Halbert, 44, pleaded guilty in U.S. District Court in Honolulu on Tuesday to conspiring to launder bribe money he accepted from the president of a Hawaii civil engineering company. Authorities say Halbert accepted a bribe from Frank James Lyon of Lyon Associates Inc. in Honolulu in exchange for $7.8 million in government contracts. The Federal Courthouse building in Honolulu. Lyon, admitted to the bribes last month in a plea agreement and faces a maximum five-year prison sentence. Those payments included some $250,000 in bribes to unidentified state government officials to secure a $2.5 million contract in Hawaii, according to the deal. Reports say Halbert was a civil aviation assistant secretary in the Federated States of Micronesia and is the son-in-law of Micronesia President Peter Christian. Authorities say Halbert faces a maximum 20-year prison term at his sentencing in July and is prohibited from leaving Oahu while free on bond.